First he settled on the pattern. Russ followed Jen's (Glinda Quilts) pants bag tutorial. Jen sent me a pants bag as a gift last year, so I gave that to him to help him see how it was constructed. That was just me being overly helpful. Other than one broken needle from sewing over a pin, he did a great job! This is one of the two bags he made. I didn't get a photo with the drawstrings, but you get the idea. 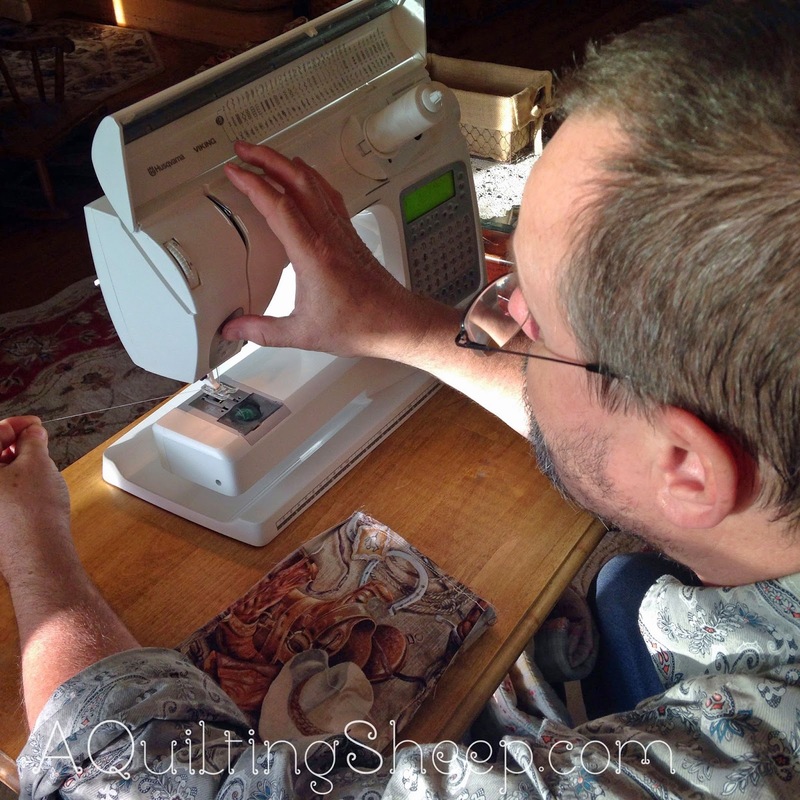 While he was working on his projects, I was making a quilt top out of the Sew Sweet Bee house blocks that were made for me earlier this year. I chose to add my initial instead of another house. Notice the fabric used for my letter "A"? I adore that your husband sewed his own drawstring bags. 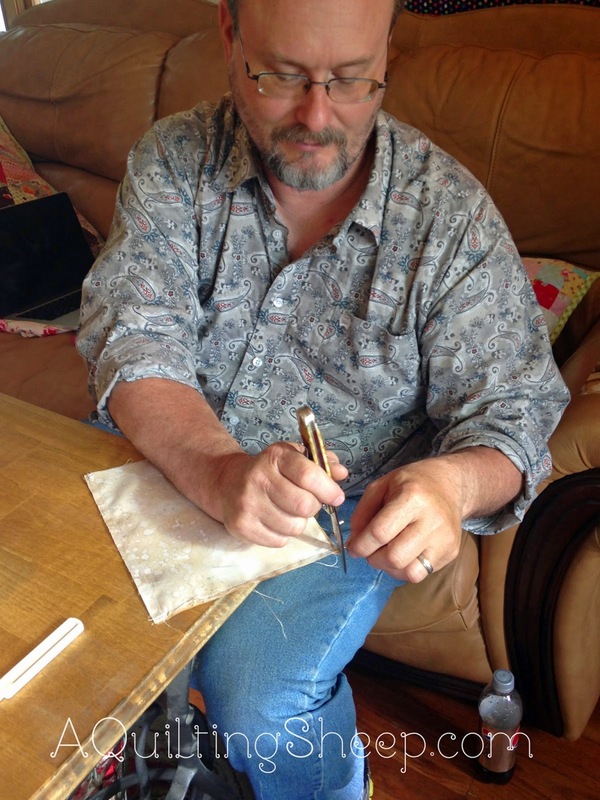 Very manly use of his pocket knife for cutting the threads. Nice fabric for them also. Way to go Rusty! I don't trust my sweety anywhere near my sewing machines or scissors. What funny! 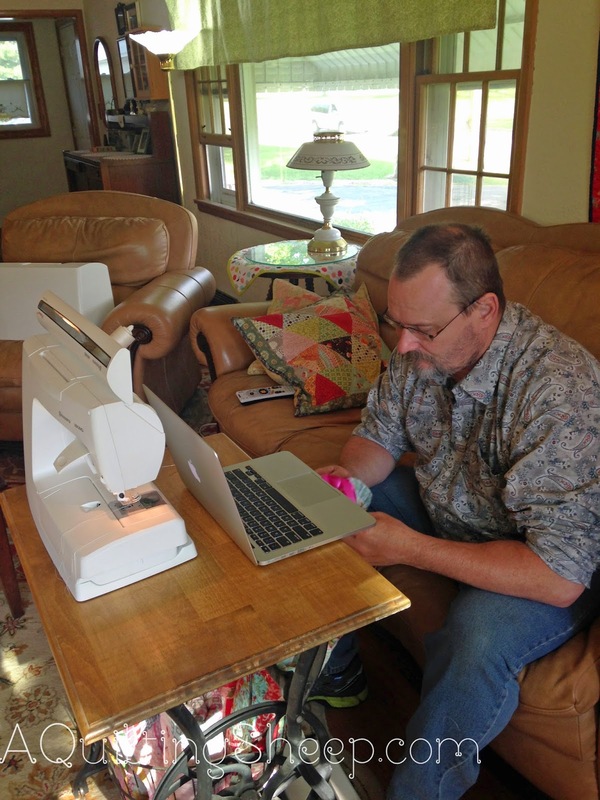 My husband also sews. He has made numerous quilts. The first year I taught him to sew he made a new quilt every month. All for gifts or donations. He decided to sew because I would not buy the fabrics that he liked. We each have our own stash. Yea for Russ! My hubby has made some bags, and wants to make more stuff. Looks like your trip was nice, too (last post). Yes, I usually need a day or more to recover from my trips. His bag turned out great! I love your quilt too and the A is baaaa-utiful! Amy your house quilt is just so darn cute. Love seeing everyone's houses together. This is wonderful. Darren likes to sew too (when needed) on my Old Singer machines. I love your "house quilt" it turned out so good! Love your bright beautiful House Quilt with the big 'sheepy' letter 'A'! Great Man sewing too. Yep - why use the scissors, when a pocket knife is handier :)! That's great! My hubby often helps me pick a pattern. Love that he made his own bags! 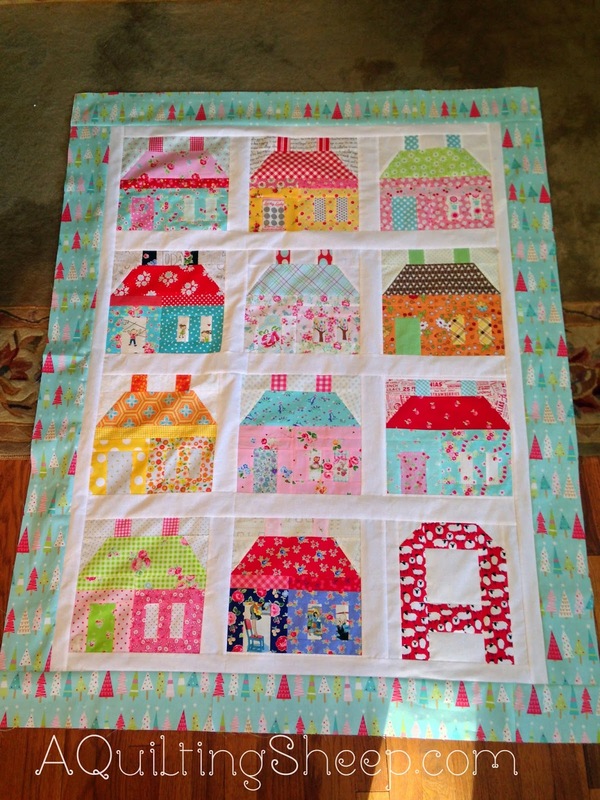 Cute quilt awesome house nlocks snd the initial. My husband will try many things but I don't think he would sew his own cloth bag. Fun post. I like what you did with your Bee blocks, the A block with the sheep was a perfect touch. Your house quilt turned out very nicely! :-) The sheep are cute and so appropriate. Love love the house quilt. Well how fun is that! 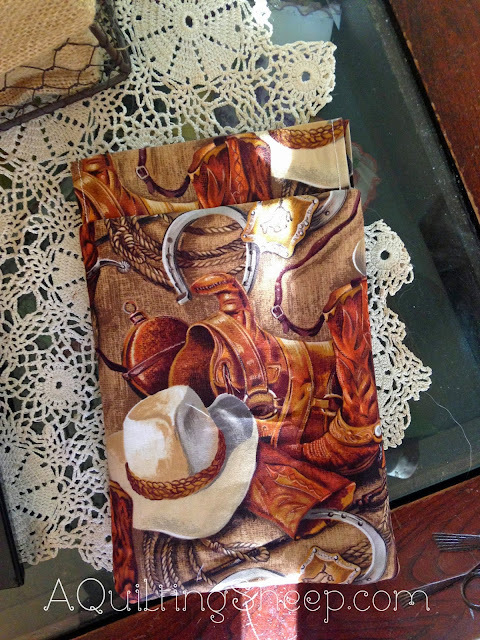 I love the fabric he used for his bag. And I love love love your house quilt, with your sheep letter! My husband gets impatient with me not sewing what he wants too. LOL Your quilt turned out great, I love it!